Join City of Detroit Planning & Development for two upcoming community events. 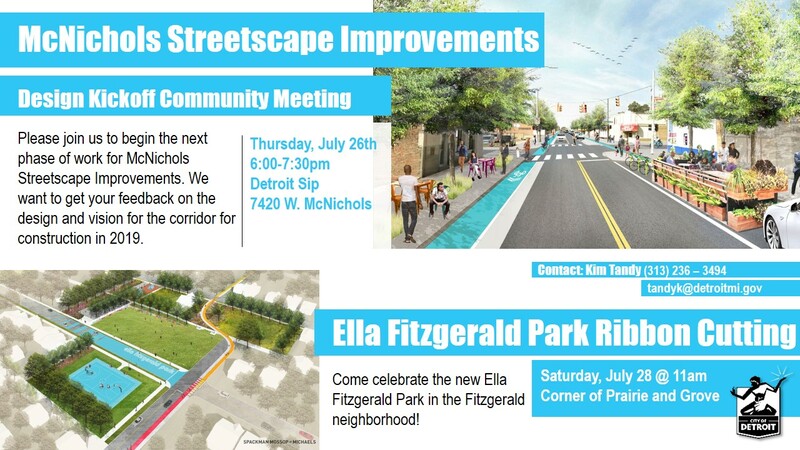 The McNichols Streetscape Design Kickoff Community Meeting will be held on Thursday, July 26th at Detroit Sip (7420 McNichols) from 6:00 – 7:30 p.m. The Ella Fitzgerald Park Ribbon Cutting will take place Saturday, July 28 at 11 a.m. on the corner of Prairie and Grove.